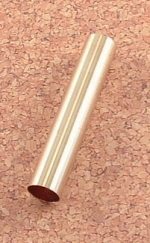 Gold plating and Copper tip, with AR clip. Bushings for our BPT 30 Caliber twist bullet pen kit. 10mm tube. Replacement tube for the .30 caliber twist pen.